I normally don't blog on Saturdays but Daughter2 is turning 21 today and although I've blogged about her all week I still need to say happy birthday to her here on the actual date. Plus I want to share a video I made in honor of her special day. I've removed or edited most of the captions for privacy's sake but she has an original so no worries. What a beautiful tribute to your birthday girl! Hope she has the best birthday! I don't have the flashplayer so I cannot view the slides. However, the one picture I do see shows three lovely looking beauties. You must be the one adjacent to the gent. Our grandson just turned 21 a few weeks ago, is a U.S. Marine. Wow! That was incredible! You guys have been to so many countries. She is a lucky girl and looks like a sweetie. Happy Birthday to M. and may she be blessed! Awesome! Thank you so much for sharing all those adorable pictures. Your girls are gorgeous and have certainly seen the world. HAPPY BIRTHDAY TO YOU DAUGHTER #2! Fantastic! Happy Birthday to DD2! Great tribute! Love her eyes! 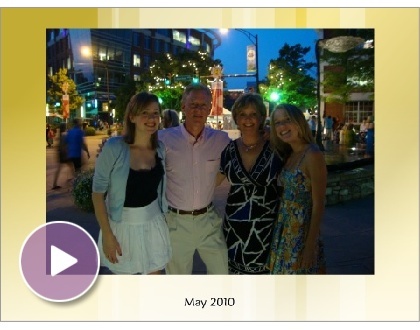 What a lovely, lovely slideshow! She looks so much like you. And, can I just say, your family has seen more of this world than most of us would ever even dream of seeing, other than in our dreams. Thanks for sharing in this most special birthday! Oh, you're such a great mum! Your daughter is so lucky. That was beautiful. What a treasure it must be to your girl to have a mommy who loves her so much.